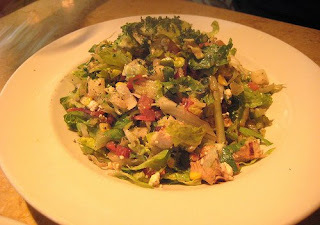 In a large bowl, combine lettuce, chicken, tomatoes, avocado, corn, bacon, blue cheese and apples. Toss until mixed. Add amount of Balsamic Vinaigrette desired, tossing well. BALSAMIC VINAIGRETTE: In a small food processor, combine 1/2 cup olive oil, 3 tablespoons balsamic vinegar, 1 generous teaspoon Dijon mustard, 1 tablespoon chopped shallots, 1 clove garlic, crushed, 1/2 teaspoon sea salt and 1/4 teaspoon freshly ground black pepper. Process until well blended. Makes a generous 1/2 cup dressing. If making in advance, refrigerate, covered, until serving time. Being stylish is about enjoying your life and expressing yourself and your inner light. See the link below for more info.